CNN Host Jake Tapper and Sanders were discussing Trump’s recent executive order limiting Dodd-Frank, a set of financial regulations put into place following the economic crash of 2008. Tapper began that portion of the interview by playing a clip of Trump talking with Jamie Dimon, the CEO of J.P. Morgan Chase. And then, suddenly, he appoints all these billionaires. His major financial adviser comes from Goldman Sachs. And now he is going to dismantle legislation that protects consumers. And then he appoints all of these guys who are precisely going to cut Social Security, Medicare, and Medicaid. Look at his Cabinet. We have never had more billionaires in a Cabinet in the history of this country. Look at his appointees. These are people who are going to after the needs of working families, the elderly, the children, the sick, and the poor. That is called hypocrisy. You know what? Men and women in our military did not stand up and fight and die to lead us in a direction of an authoritarian society. We’re a democracy, not a one-man show. We are not another Trump enterprise. It’s called the United States of America. We’re not a business run by Mr. Trump. I hope that Senator McConnell, who is a decent guy, conservative guy — I disagree with him on everything. But I would hope that he and his Republican friends will make it clear to Trump that this country belongs to all of us, and it’s not a one-man show. 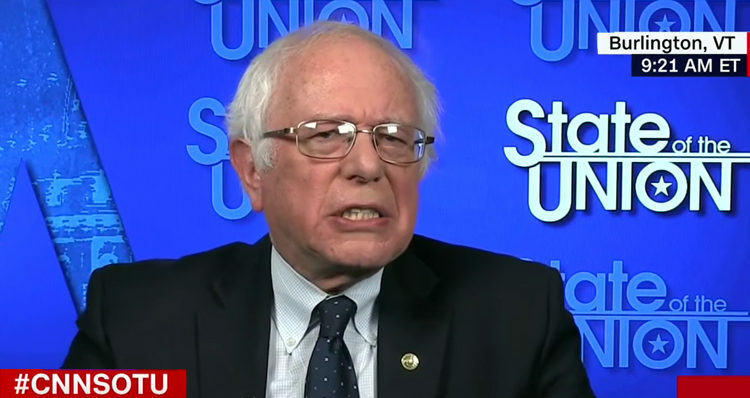 You can watch Sanders discussing Trump in the clip below and you can go here to watch the full interview with Tapper.